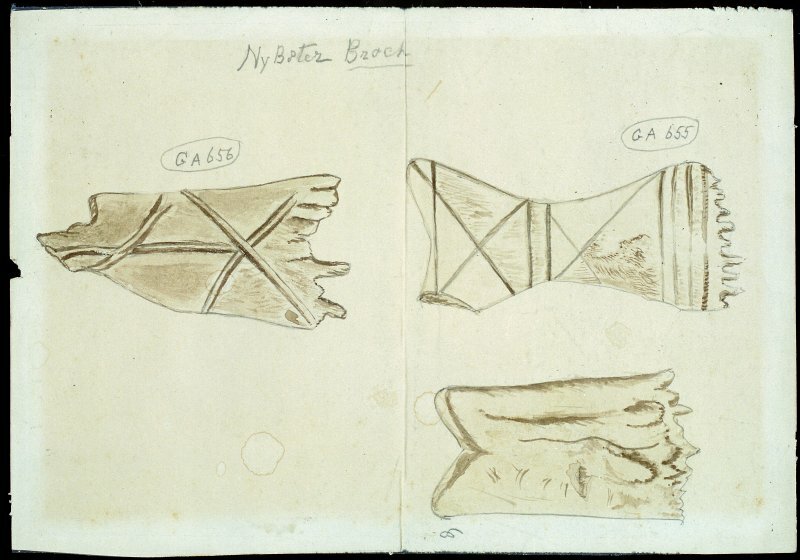 Scanned image of watercolour drawings of three bone weaving combs. Annotated 'Nybster broch' Two of the objects are labelled with museum accession number 'GA656' and 'GA655'. Description Scanned image of watercolour drawings of three bone weaving combs. Annotated 'Nybster broch' Two of the objects are labelled with museum accession number 'GA656' and 'GA655'. Scope and Content Watercolour of bone combs from Skirza and Nybster brochs, Caithness, Highland Skirza and Nybster brochs are located between Keiss and John O' Groats on the north-east coast of Caithness and were excavated by Sir Francis Tress Barry (1825-1907) between 1895-7. Both occupy narrow promontory sites that are cut off from the mainland by a defensive ditch and defended on three sides by sheer cliffs. This watercolour by John Nicolson (1843-1934) shows three bone combs that were found during the excavations of these sites. These would have been used for textile working. However, some are elaborately decorated which suggests that they were regarded as more than simply functional items. Nicolson was born at Stemster, John O' Groats, and lived in Nybster for most of his life. He was an accomplished artist and keen archaeologist who dedicated much of his life to studying the prehistory and history of Caithness. This watercolour is of particular interest: the label indicates that all three objects are from Nybster broch contradicting later records claiming that the bottom comb was discovered at Skirza. Source: RCAHMS contribution to SCRAN. >>> Item Level (SC 876624) Scanned image of watercolour drawings of three bone weaving combs. Annotated 'Nybster broch' Two of the objects are labelled with museum accession number 'GA656' and 'GA655'.